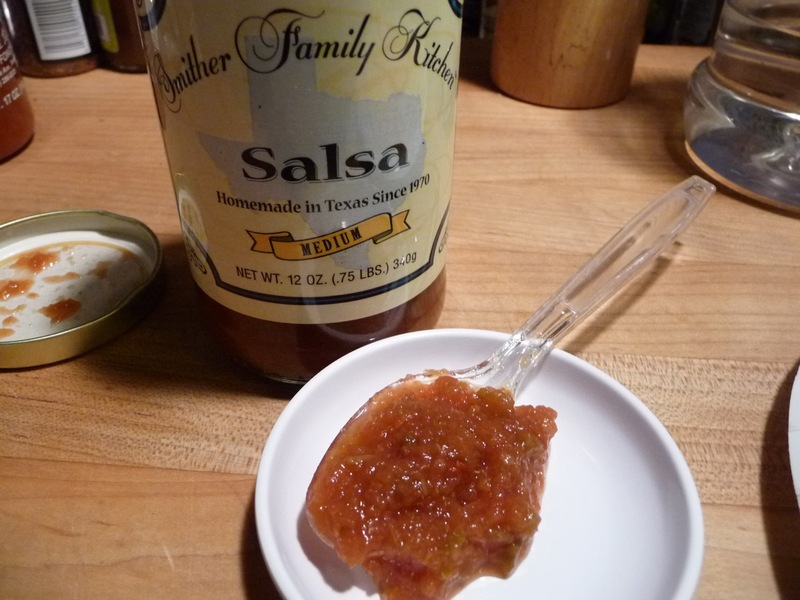 Just last week in our Week of Mild series we featured the Smither Family Kitchen’s Dillapeño Salsa & Relish condiment… so now here’s our take on their Smither Family Kitchen Salsa – Medium. What’s the difference you may ask? 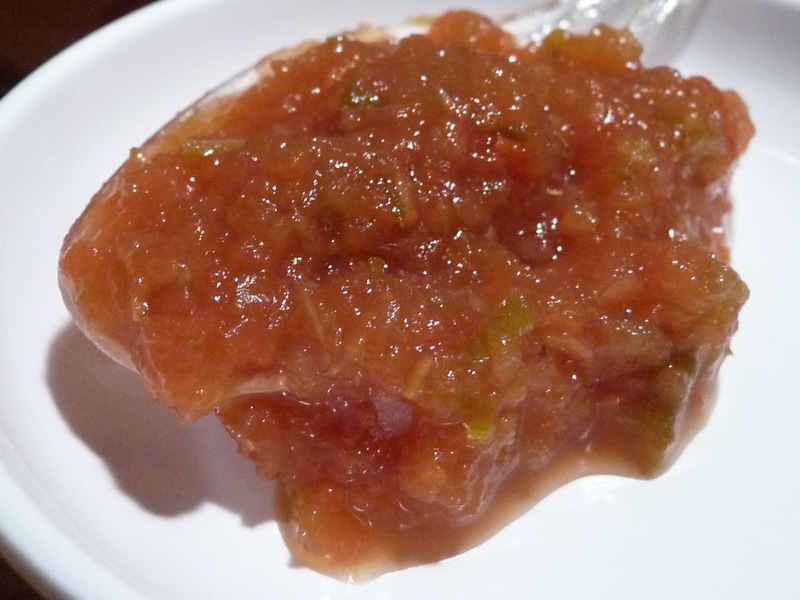 Well, the Dillapeño was a sweet jalapeño condiment – more of a relish, and this one is a salsa. Labeled as “Medium” in heat (I doubt that), this jarred salsa is very heavy in the onion flavor department. You wouldn’t know it by looking at our pics, but believe me, it’s onion-y. Not that there’s anything wrong with that. 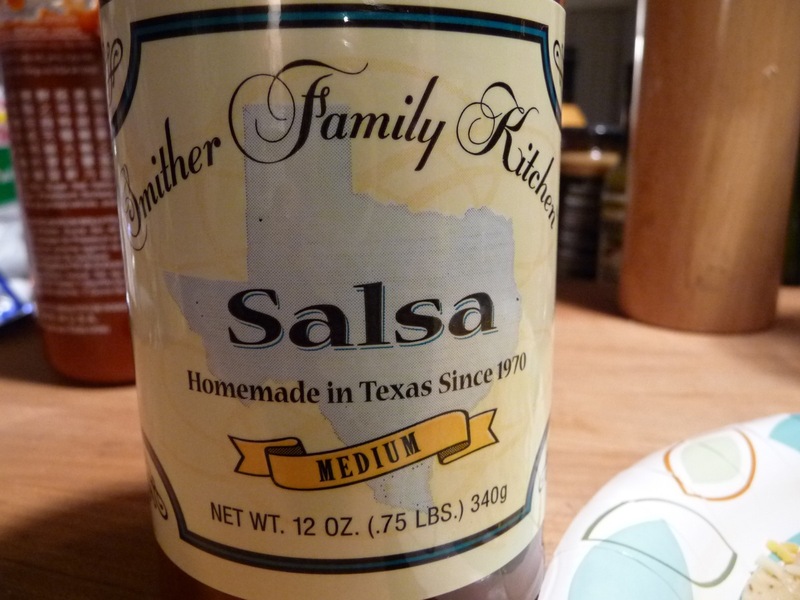 These 12 ounce bottles, straight out of the heart of Texas, bring a nice, fresh, albiet mild taste to the realm of salsas. Texture & Appearance: Chunky and bright red (probably from the diced tomatoes), this is a strong contender for a robust flavored and hearty contender in the salsa market. 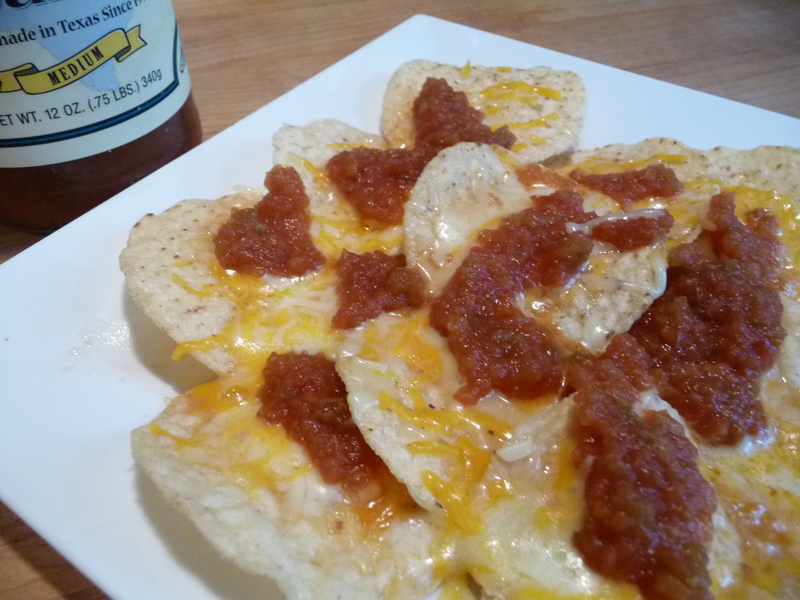 A big, bold consistency that holds up strongly on chips and cheese in nachos, this mild salsa is no wimp. Taste Straight Up: Straight up, in a spoon, there’s a huge hit of onion, followed by the mild sting of jalapeños and the green chiles. The added sugar sweetens and mellows things out. Marilyn remarked that this would be a great addition to a pasta sauce. I have to admit, there is a slightly “Italian” slant to it, due to the abundance of tomatoes, onions, and sugar. Heat Level: – Very mild, yet refreshing. Delicious. Label/Graphics: An overall simple label and graphics – something you would see at a roadside stand. 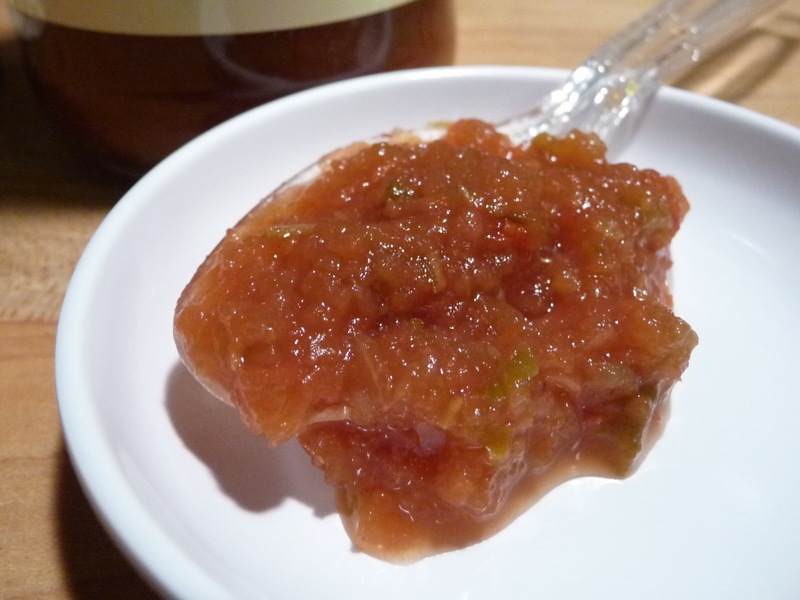 Overall Rating (Taste on Food, Final Thoughts): – Just shy of our best rating, this salsa is delicious, savory, and very mild. We dipped chips in it, and layered it on simple nachos, and it just rocked each time. 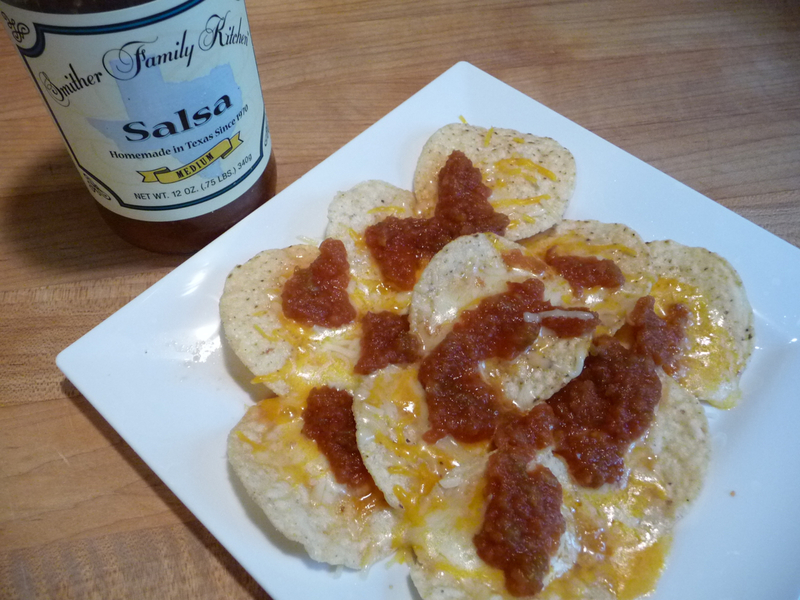 Smither Family Kitchen salsa on nachos rocks! I’d like to see it offered as is, in pints or quarts. Marilyn has a great idea for adding it to pasta sauce, so we’d need bigger jars. Also, I’d like to see this salsa recipe in a bolder, hotter form – say more green chiles, just a bit less onion, and labeled as “Hot” in flavor. Smither Family Kitchen has 2 great products that we’ve reviewed here, and you can be sure we’ll report on more of their offerings in the future. Austin, from Smither Family Kitchen has assured me they are working on a new product. You’ll hear about it first right here. I found this to be a little hotter than your normal grocery store/Pace/Chi-Chi’s Medium offerings, but not too hot for most folks. The onions are so abundant that they almost impart a boullion flavor, similar to what you’d find in an onion soup mix. After eating a few bites on chips, and straight up from the spoon, I’d say if you like onions in your salsa, this one meets Buddah’s (of http://www.ILoveItSpicy.com) “Addictability” criteria!